In September I posted a blog about my school's atrium. I was hoping to put in for a grant and turn the atrium into beautiful place for students to gather. One Friday morning I attended a meeting to discuss the atrium. In attendance was a member of the Winnebago County Extension office. He had a load of grants we could apply for up to $50,000 to redo the atrium. The grants however required that students were learning about how to go green. I had the idea that students learn to compost. We could have students compost food scraps from school lunches. However the head of building services said the the health inspector has already said they would shut us down in a minute if we had any kind of composting on our school grounds. The health inspector said that composting means critters. I have a compost barrel in my yard, and have never had critters but I guess it happens. Another idea we had was rain barrels, since it would make it easier for students and staff to water plants and would be conserving water. But again we were told rain barrels could bring in unwanted critters. So the head of building services said maybe we should just try to get local support since he couldn't see how we could do anything to show conservation with students. I brought up the idea from P. Allen Smith of having the students plant daffodils, and then selling bouquets of them in the spring. 75% of the time the atrium will be covered in snow, so I thought spring blooming bulbs would be easy and be beautiful at the same time. We also talked about having the art classes create art for the atrium, whether it be stepping stones, sculptures, or murals. 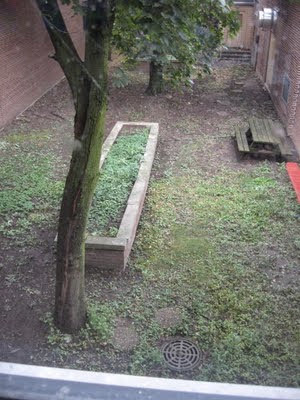 We also had the idea of seeing if the tech ed classes at the high school could build us lots of seating for the atrium. We agreed that we needed to find out what the other teachers would like to see happen with the atrium. Since in order for the project to be a success we needed vested interest. We are going to survey staff, and agreed to meet again in November to further discuss the project.